£2,000 insurance rating, 30 minute fire rating. Shelf can be removed to create more space. Double walled steel body and door. Door includes three 23mm diameter locking bolts. Installs to floor or wall (bolts not included). † Add 5mm to external depth for handle. Construction Double walled steel body and door filled with fire resistant material. 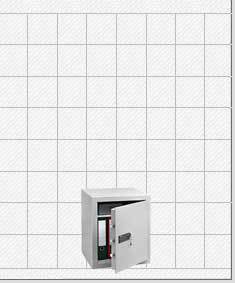 Burg Wachter	The Burg Wachter CityLine C4S is a security safe designed to protect cash and valuables from theft and paper documents from fire. This safe comes with a recommended insurance rating of £2,000 cash or £20,000 valuables and also offers 30 minutes fire protection. The safe door is secured by a high security double bitted key lock, supplied with 2 keys and the back and base of the safe are pre-drilled with fixing holes for floor or wall installation. There is also one smaller size available in this range.